First impressions, although very important, can be quite deceiving. Since my debut last Thursday to "Dogs on Thursday" many of you probably formed an opinion of me already. Many may have the idea that I am a typical bulldog, ferocious eater, big sleeper, rather slow, snores loudly, (well, maybe that one's true) and non-chalant about life. Please, allow myself to enlighten you. Deep thinking is something I allow myself. 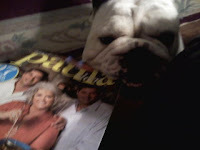 Relationships are important to me and I try to share reading interests with Mom sometimes but she is stingy with her magazines. I spend a lot of time in negotiations and discussions face to face with Dudley, sure, I sometimes try the strongarm technique but I find that stepping back and rethinking the situation is a smart move. Much of my time is spent in thought. Take this morning for example, my mom took me outside for my personal business around 6:20 and very quickly I grasped that it was the coldest morning so far this winter, around 18, but felt colder. I wanted to mix things up a little, thought perhaps if she had a little more activity out there it wouldn't feel as cold. Even though I always relieve myself quickly and head back in for the couch, this morning I decided to go on far out and perform more in depth "duties" for a change too. Yeah, I know, I always do that much, much later in the day but like I indicated before, don't assume that you know everything about me. Not much gets by me, from what I can tell, that BigBoy that I love so much must be coming back around soon cause they have been talking about it. He is in my thoughts alot and I can do some fast running around the den when he comes in the door cause, again, don't assume that I am slow.....my family very often has a difficult time catching me because I am so fast. Since I am so curious about things I stay in my crate sometimes when they can't keep a close eye on me cause I love to "look" around the place with my mouth. O.K., maybe I am feeling a bit sleepy now, but it is my hope that this has shed some light on who I am. Now, go spend some time in reflection on what I have shared, just as I take moments for quiet time and ponderance gazing out the window in dad's study. Ah Dudley is so cute. He looks like such a sweetie. I love that comment," I like to look around with my mouth". Boy can my guys relate to that. hello gorgeous. you are such a handsome fella, i am in love with you, but then you know that as i say it every week. when you coming to visit your auntie sb in london? i have mentioned you again on my dot post, i just couldn't help myself. Oh my gosh, this is so adorable! I love these Doggie Thursdays.